Despite the cool nights and the occasional cool day, summer has come to Maine. In fact, as someone who has seen a lot of Maine summers, this, so far, has been an old-fashioned June with some rain, some sun, some warm days, some chilly ones. It is only during the past five years that Maine Junes have become so warm. This June is a throwback to the old days, and it feels quite normal to me. Rather than warm weather, summer in Maine is heralded by green in all its cool shades. Our backyard, indeed all of Winthrop, is enveloped by green—the leaves, the evergreens, the ferns. Our patio is our summer living room, and Clif and I spend as much time there as we can. For much of the year, we are cooped up inside, and it is a relief to be outside, unencumbered by hats, coats, and gloves. Yesterday, after doing yard work, we had our tea on the patio. 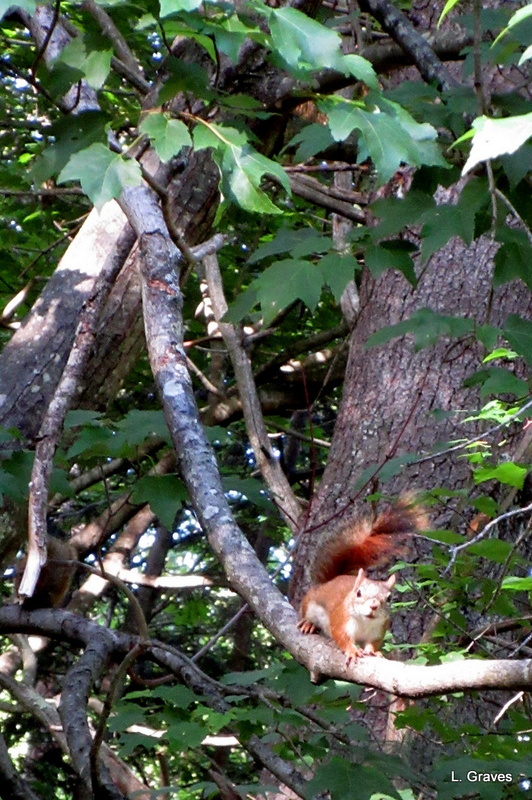 A red squirrel, in a nearby tree, scolded us. I suspect the little creature wanted to raid the brown bird feeder, and we were too close for comfort. With a twitch of the tail, the red squirrel continued to stare at me and chitter even louder. To add to the backyard noise, hummingbirds whirred and chased each other away from the feeders. Occasionally, one of them even got something to eat. A swallow tail butterfly fluttered by, too quick for me to get a picture. Best of all, the dragonflies have come, and the mosquito population has dropped noticeably. 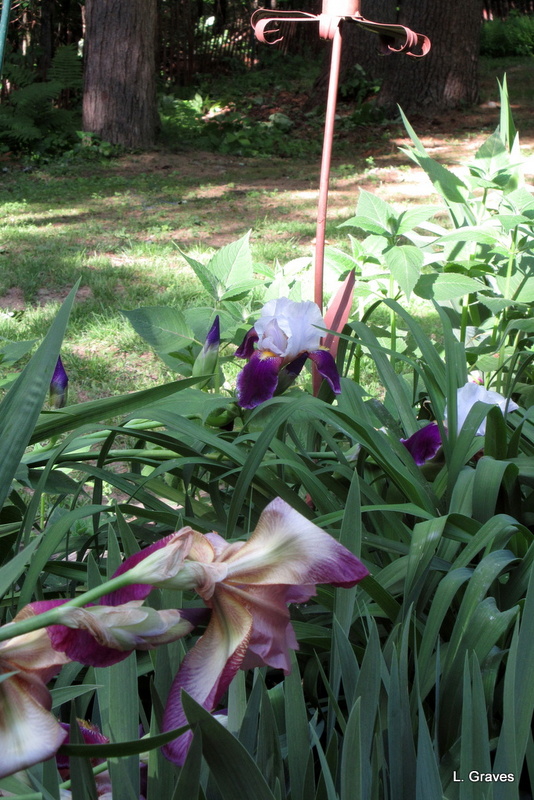 This spring, I neglected to stake the tall irises, and they have drooped pathetically over neighboring plants—begonias, daylilies, and evening primroses. 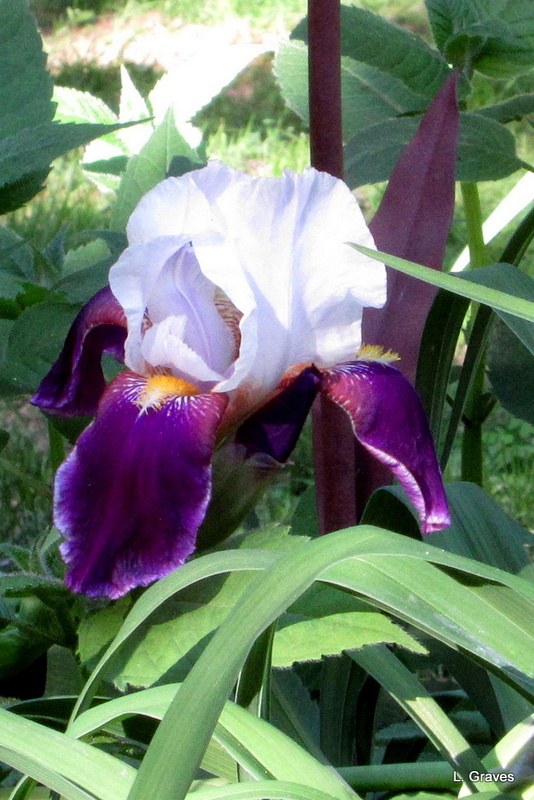 Next year, I will try to do better, but even though the irises have fallen, they are still beautiful. As I sat on the patio and listened and watched, the spirit of a black and white dog zoomed around the perimeter of the yard. Barking and racing, setting the boundaries. Then the past and the present came together—the birds, the spirit dog, the flowers. So much happening on one little half acre. Many, many thanks to you all. Although everything is late, spring has finally come to Maine. The hermit thrushes are back with their pan-pipe songs. 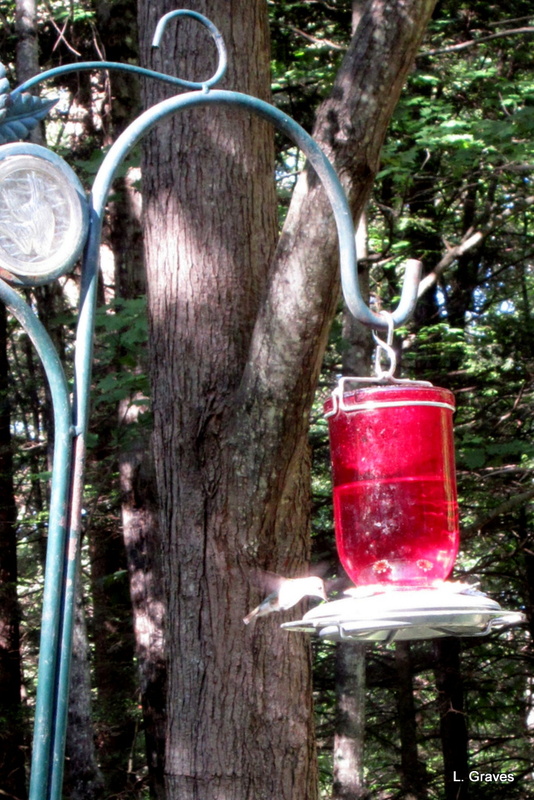 Yesterday, I saw a hummingbird—time to put up the lovely red feeder Clif bought me for Christmas. It’s been sunny and warm enough for lunch on the patio, and mild enough, even, for an hour on the patio when Clif comes home from work. Best of all, the black flies, the scourge of the north, have yet to rear their ugly little heads. Dare I hope that this will be a sparse spring for black flies? I sure do! Such a busy time of year. For the next few weeks I will be digging, planting, and, in general, grubbing in the yard. 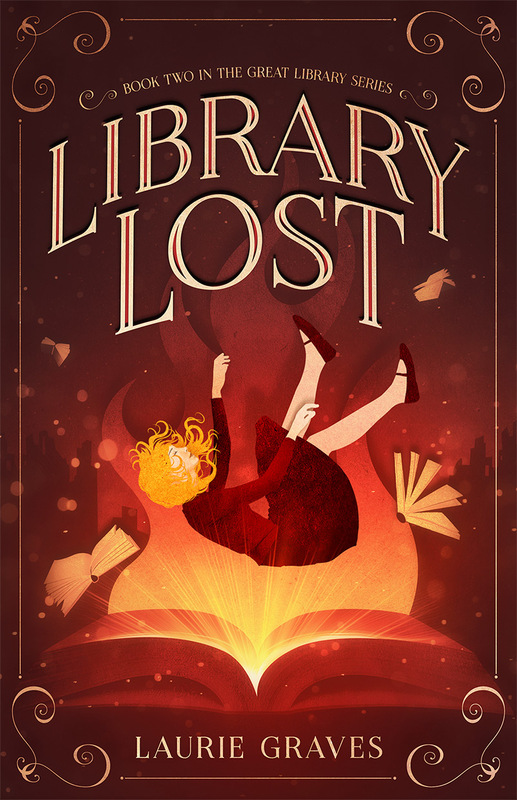 There is also a lot going at our library, with the expansion entering its public phase. (I’m a trustee and a volunteer.) There will be a kick-off celebration next week, and—surprise, surprise—I was the one to organize the food. Busy or not, I’m still cooking dinner every night, of course. Clif and I hardly ever eat out, and I even have a recipe to share—chickpea cutlets—and another to experiment with—chili made with black bean “meat balls.” But these recipes will have to wait for either a rainy day or June. In the meantime, here is a picture of the chickpea cutlets, adapted from a Mark Bittman recipe. My, my, they were tasty, if I do say so myself. A definite make-again dish. This Sunday is Mother’s Day, and at the little house in the big woods, there will be a waffle brunch, complete with home fries, fruit salad, and an egg dish. I’m told there will even be chocolate cupcakes for dessert. Happy spring and Happy Mother’s Day to all! Spring in Maine continues to be cold and gray. I am still wearing my winter garb—turtle neck, sweater, big corduroy shirt—and that is inside the house. Outside, I am even more bundled up. Despite the recalcitrant weather, the grass is turning a bright green, and undeterred by cold, the perennials in my garden are bravely emerging from their winter sleep. However, I’ve heard that many farmers are behind in planting peas. The soil is just too cold for seeds to germinate. But right on schedule, the maple flowers have started falling from the trees. Although May brings many delights that are much showier than this delicate flower, I’ll miss the cheerful red fringe on the maple trees in my backyard. Until I took a picture of a maple flower and then cropped the photo, I had never really examined this little flower. I had never noticed the wave of stamens, the burst of petals, the lighter center. Instead, I had seen them the way an impressionist painter might, a welcome dab of red in a landscape just beginning to show color. The maple flower is a reminder for me to slow down, to look closely at what surrounds me. All too often I rush through my days, checking off one chore after another: Vacuum, make bread, tidy the kitchen, work in the garden, do laundry, write, type the minutes for the last library trustee meeting, bike to the food pantry to volunteer. Chores certainly need to be done, but there must be some kind of balance between doing and looking. Listening and smelling should also be added to looking. Perhaps a better word would be noticing. Or observing. After all, what kind of life do we have if we are so busy doing that we never take the time to notice, to observe? Whether you live in a suburb, in a city, or in the countryside, there is always something to notice—the changing of seasons; nature, even in cities; the weather; sun and rain and clouds and sky; other people; buildings; animals. There is so much to observe, wherever you are. Best of all, you don’t have to have a lot of money to observe closely. This is something the greedy financiers, who have grabbed and ruined so much, cannot take away from us. Despite how much actual money you might or might not have, a life spent observing, looking, and noticing is a rich one. I’m thinking it might be time to buy a magnifying glass, so that I can look even more closely at the little marvels all around me. Last week, the little house in the big woods was snowbound, with only the barest hint of bare ground in the backyard. While the front yard still has plenty of snow, the backyard has made real progress and now has more bare ground than snow. And all in one week! Yesterday morning, I hung clothes on the line for the first time this season, and there was a thin layer of packed ice around the clothes line. It was so slippery that I wished I had worn my grippers. I didn’t fall, but I had to be very careful as I hung the laundry. But in the afternoon, when I took in the laundry, the ice had completely melted. It almost felt like time-lapse photography in real time. There is much to do in the backyard, but it is still too mucky for a real clean-up. I love this time of year—working outside in the warm sun. It beats anything I can do inside, and that includes cooking or writing and most certainly cleaning. I’ve had this sage plant for 3 years. Will I get another year out if it? Even though it is much warmer now than it has been since, say, October, it is still cool enough for soup and probably will be until June. This is Maine, after all. And soup—tomato chickpea—is what we will have for supper tonight. From the four Cornish hen carcasses left over from our anniversary meal, I made a stock in the usual way—with water, onion, garlic, peppercorns, and salt. After the stock had simmered for several hours, I let it cool overnight in the refrigerator so that I could skim off the fat. In addition, I soaked 2 cups of dried chickpeas overnight and cooked them in the morning. Into the slow-cooker went the stock, the chickpeas, and a 28-ounce can of tomato puree. Since I had a lot of the tomato stock, I coarsely chopped 6 carrots and 4 ribs of celery and sauteed them with olive oil, adding 3 cloves of garlic for the last minute or so. After the vegetables were soft, I added them to the slow-cooker and let everything bubble for four hours. Because the Cornish hens had been so wonderfully spiced, I did not need to use additional spicing in the soup. Otherwise, I would have added some rosemary and perhaps some oregano. Tonight, I’ll cook some pasta, which we can add to the bottom of our soup bowls. We have found that pasta put directly into the soup swells and swells until the pasta is quite unappealing. So now we add pasta directly to our bowls and ladle hot soup on top. This made a huge batch of soup. Clif and I will eat it for several nights, and I’ll freeze the rest for that happy, busy day when there’s too much going on outside to fuss in the kitchen. And just for something a little extra, here’s a spring song, courtesy of Sesame Street. In our family, whenever there is a special event, the tradition is to cook a special meal. We all love to celebrate with food—no surprise there—and by cooking at home, we can have something especially tasty yet still be frugal. Our anniversary was last month, but because of the various schedules, Shannon and Mike couldn’t get together with us until yesterday. We had planned to go to Shannon and Mike’s home in South Portland, but for our anniversary they bought us a special gift—a new rug for our living room—that needed to be transported in their larger car. Our little Honda Fit can hold quite a bit, but there was no way it could haul that rug along with a driver, one passenger, and a dog. Now, Clif and I are a very thrifty couple. When we buy something, either new or second hand, we squeeze every bit of use out of that item. So it was with our living room rug, which we bought thirty years ago at Sears. I loved that red rug with its oriental design, and it was incredibly sturdy, withstanding kids, pets, and lots of company over the years. But all things have a lifespan, and so it was with this rug, which had become frayed, worn, and thin in many spots. On Saturday, we rolled up the rug and brought it to the transfer station, and it was a bittersweet moment. I was sorry to see this old friend go, but I have to admit I was excited to be getting a new rug. (So excited that I forgot about a special dessert Shannon was bringing. Very uncharacteristic of me, and more about this later.) When you don’t get many new things, you really appreciate it when you do. And that’s the way it way should be. Between mindless consumerism and the life of of a monk there is a balance. For our anniversary meal, Shannon prepared one of the the dishes I love best—Cornish hens with a lemon, herb, and butter mixture tucked under the skin. The hens were moist and flavorful and because they were small, all of the meat was suffused with the herb butter mixture. We had baked potatoes, corn, and sour dough bread to accompany the hens. Then there was dessert, which Shannon bought from Little Bigs in South Portland. The pastries are called CDs, short for “Cease and Desist,” and they are fried croissants dusted with cinnamon and sugar and cut into squares. The CDs have a hole, and they bear a striking resemblance to an insanely popular New York dessert that apparently must not be named. Hence “Cease and Desist.” The CDs were crisp on the outside, flaky but not dry, and we promptly munched them down. Good as the CDs were—and they were very good indeed—I must admit that I remain loyal to donuts, one of my favorite desserts. But what fun to try something new that has become a craze in New York City and is now a craze in Portland. CDs have become so popular that Shannon had to order them three or four weeks in advance. A visit from the kids, a new rug, Cornish hens, and CDs. All in all, a terrific day. Yesterday, as I was returning from a walk with the dog, my neighbor, who was walking her own dogs, stopped to talk to me at the end of my driveway. “I think you have the coldest yard on this road,” she said, looking at all the snow. By the end of the month, the snow should be gone, but it has a long way to go. Never mind! Yesterday, I took an absolutely delightful walk. The sun was shining, the birds were singing, and I needed neither hat nor gloves. I walked in a sort of a bliss, letting the dog lead the way. He took me down Highland Avenue and around Highland Heights. Blue sky, blue sky, blue sky with the sun warm on my face. Here are some pictures I took, proof that after this long, hard winter, spring really is coming. This last picture is not particularly a sign of spring, but I’ll include it anyway. To borrow from the meteorologist Lou McNally—also known as Altitude Lou—March came in like a lion and went out like a mess. At the little house in the big woods, it is sleeting outside. The road is thick with slush, and there is a layer of ice on our car. What a trickster March is, and it couldn’t resist one last icy prank before giving way to April, which I hope will bring better weather. After all, the snow in our yard is bound to melt sometime before July. There will be plenty of scraping if I do errands, as planned, this afternoon. In the interest of being fair to March, that long, long, temperamental month, I have to admit it does have its moments of beauty, if you know where to look. The following pictures were taken a few days ago, when the sun was shining, and it was relatively warm, say 45 or so. Nevertheless, I am certainly ready for April.